On the afternoon of May 12, Climate Change Coordination Office (CCCO) in collaboration with Institute for Social and Environment Transition (ISET) and Da Nang Women’s Union organized an Inception Workshop for the project “Implementation of Incentives to build climate change resilient housing for Vietnam urban poor communities”. The workshop is aimed at disseminating information, detailed outputs and work plan of the project, funded by Nordic Development Fund via VISTA ANALYSIS, a social science consultancy. Delivering the opening remarks, Da Nang People’s Committee Vice Chairman Phung Tan Viet emphasized that since 2005, the city has focused on implementing several social security programs, in which Housing is one of the focus contents, shown in the “3 yes’s” program that aims at ensuring all local residents have their own houses, a stable job and a cultural lifestyle. In particular, the issue storm and flood resilient housing for the community of the city is one of 04 focus areas in strategy development process, under the framework of the “100 Resilient Cities” program – 100RC. Therefore, the implementation of the project at this time is very appropriate. Accordingly, he assigned Climate Change Coordination Office (CCCO) to continue to work with ISET, project owners and stakeholders to study and advise the city to integrate the activities and results of this project. Besides, the city needs to connect with platform partners working on housing issues such as the reinsurance company SwissRe, Vietnam National Reinsurance Corporation-Vinare, and AkzoNobel Global. With this approach, housing for Da Nang citizens can be best supported. As one coastal city in central Vietnam, despite benefited with advantages of tourism, seafood exploitation and processing…, Da Nang has to bear severe consequences of storms and floods. Thus, storm and flood resilient housing for Da Nang residents has always been a huge challenge to the city’s authorities especially in the context of these natural disasters becoming worse due to climate change. 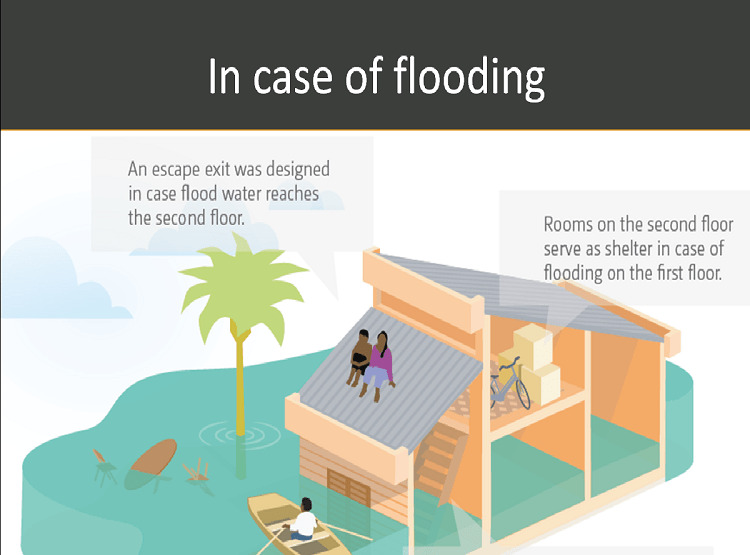 Emergency solutions and aid after natural disasters are often conducted for poor households but there is less support in calamity prevention. Moreover, there are few incentives for the poor to build storm and flood resistant housing. According to a housing survey in Da Nang, there are 92,152 permanent houses, 107,270 semi-permanent, 1,264 simple and 3,349 temporary. The proportions of temporary and impermanent houses stay high. Besides, it is difficult for the locals to access to concessional loans and funds of government without relevant qualifications so that they cannot get loans to repair their homes or build new ones. In 2011, with approval of Da Nang People’s Committee, the city’s Women’s Union became the key partner to conduct the project “Storm-resistant housing for a resilient Da Nang City”, piloted in 8 wards and communes of Da Nang. Accordingly, 425 houses would be repaired or newly built which can be resistant to storms level 12. Currently, the project has been applied to 414 households, one year earlier compared to the plan. Total loans which were disbursed reached around 10 billion VND. The project has proved its success exceeding the expectation when most of storm-resistant houses were not harmed after Nari typhoon hit Da nang in 2013, sustaining winds of 130km/h (level 12), destroying and blowing off the roofs of over thousands of houses with an estimated loss of over 800 billion VND (41 million USD). All of the constructions in the neighborhood were severely damaged. Considering the success of Da Nang Women’s Union, Nordic Development Fund has chosen the Union to become one of four main partners to implement the project “Implementation of Incentives to build climate change resilient housing for Vietnam urban poor communities”. 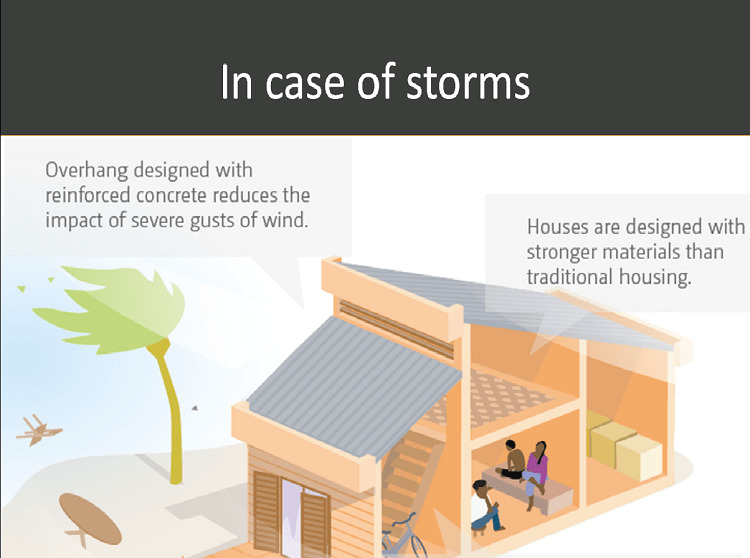 The project is aimed at increasing penetration of climate resilient housing in Vietnam that can withstand typhoons, storms and floods”, being affordable for low-income households. According to its work plan, the project will be applied to the first 100 houses with incentive mechanism and housing insurance, conducted in 30 months. Thanks to the project, the poor can access to “soft loans” to repair or rebuild their houses. Via relevant organisations, unions, businesses and authorities, the poor may also receive technical support to design and build climate change resilient housing. The total funds for the project worth 22 billion VND, of which non-refundable ODA fund accounts for 12 billion VND, and other funds from VISTA ANALYSIS, ISET, Da Nang Women’s Union and befenificiary households. This entry was posted in Climate Change, English / Tiếng Anh, flood management, urban planning, urban poverty, Urban resilience, Working Group Meeting and tagged CCCO Da Nang, climate change resilient housing, Da Nang, Nordic Development Fund, VISTA ANALYSIS. Bookmark the permalink.